Black Bear Hideaway is the ultimate cabin for those looking for a peaceful, comfortable retreat! This Pigeon Forge Cabin Rental is Centrally located just a few moments away from the town center. Experience easy access in this one-level, 2 Bedroom 2 Bath home with all the comforts of home (plus more) Black Bear Hideaway is the perfect place to visit for a Perfect Smoky Mountain Getaway! Come to the Smokies and stay in this rustic yet fully upgraded home located in the highly sought-after resort, Shagbark! Cabin by the Creekside will make you feel immersed in nature with the towering trees, meandering creek, and private hot tub gazebo located right on the creek! You will fall in love with the gas fireplace, large outdoor deck, and large kitchen/dining/living room area. With 4 edrooms, 2 bathrooms, convenietn location, and sleeping arrangements for up to 9guests, this is the perfect place for your Smoky Mountain Getaway! Beautiful log cabin in the foothills of the Smoky Mountains, located just outside Pigeon Forge inside the Hidden Mountain Resort area. Great location with a view of the mountains, enjoy the sauna on the back porch followed by relaxing in the hot tub. You can enjoy a nice evening in by the fireplace and movie or a good book. The Front porch has a relaxing porch swing to enjoy your morning coffee or cocktail in the evening. Owl Take the View is minutes away from all that Pigeon Forge and the Great Smoky Mountain National Park has to offer! When you want to Retreat to the Smokies, you won't find a better family cabin than "Smoky Retreat"! Located in the gated community of Shagbark, you are just minutes from all the action in Pigeon Forge while tucked away high on a mountain that feels like staying inside the National Park! Unique chalet located in beautiful Wears Valley area with Huge View! A View To a Thrill is located on the quiet side of the Smokies, Wears Valley! A View To a Thrill is a unique chalet with Tuscan decor, large window, WiFi, outdoor fire pit and much more! Seminole Ridge has 3 bedrooms and 2 baths. It has a beautiful view with rockers on the porch so that you can take in the scenery. This cabin has a master bath with a Jacuzzi as well as a hot tub on the deck. Paved driveway and parking area lead up to the cabin. The cabin is spacious and inviting. We welcome you to come and relax your cares away with us at Seminole Ridge. Minutes to light #3 on the parkway, nestled in Wears Valley! This cute, cozy cabin is situated in the peaceful, quiet, and privacy of Wears Valley and will "Always and Forever" hold a special place in your heart. Nestle up next to the Fireplace or take a dip in the outdoor Hot Tub. Cook a meal fit for kings in the newly renovated kitchen or head out for dinner at one of the convenient restaurants near by! An awesome little cabin in the Smokies! It is located in Sky Harbor right in between Pigeon Forge and Gatlinburg so you will be close to everything! This is a honeymooners dream with all you will need for a great vacation. There is a private hot tub on the deck behind the cabin for the ultimate in privacy and comfort. Or you can sit on the front deck and listen to the creek just below. If you're looking for a great place to celebrate your vows or just find that "newlywed spirit", look no further. Come to "The Honeymooner" for your next romantic getaway. 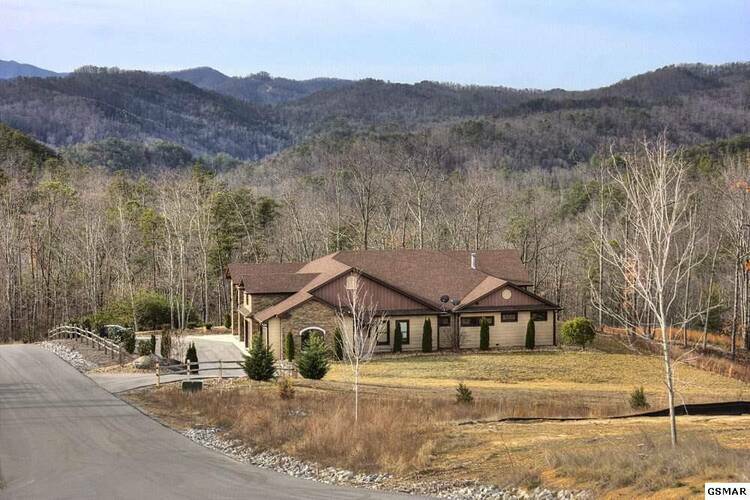 Escape reality and enjoy the Smoky Mountains in a new way when you stay at this 3 Bedroom, 2.5 Bath home in the Smoky Mountains. "Swimming in Seclusion" offers room to spread out with 3 full levels plus a loft and 3 levels of decking to sit outside and take in the spectacular view! 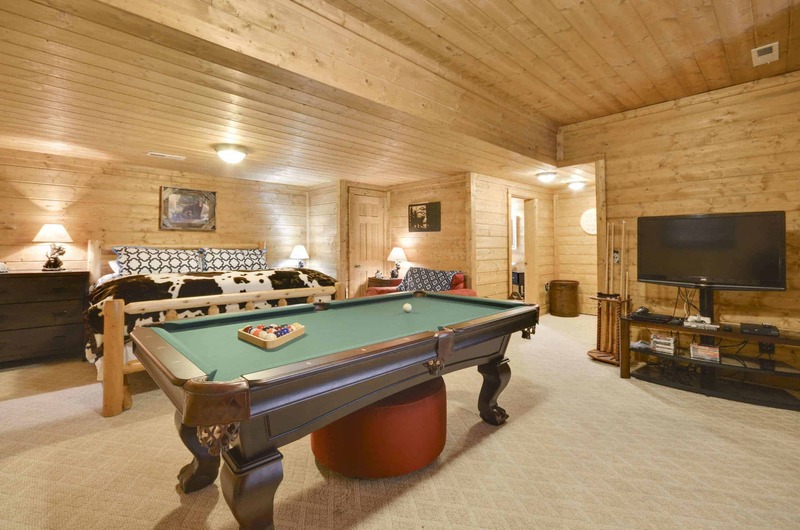 Throw on your swimsuit and relax in the hot tub or take a dip in your private in-cabin pool, play a round of pool in the game room, enjoy the private sauna, or cuddle up next to the floor to ceiling stack stone fireplace! There is so much to do, swimming in seclusion is sure to impress the whole family! Conveniently located in the peaceful setting of Wears Valley overlooking the vast mountains and valleys right outside your back door. Minutes from the Great Smoky Mountain National Park and all the action of Pigeon Forge, Gatlinburg, and Sevierville. Bama Bear's Den is ready to host your next Smoky Mountain Vacation! Appalachian Sunset is a truly unique one of a kind large-log cabin located in a gated mountain resort 10 minutes from Light #3 in Pigeon Forge. Upon entering the cabin into the living room you will be captivated by the full wall of glass windows and towering large-log walls and beams overlooking the Great Smoky Mountains. This home features luxurious furnishings, hot tub, Jacuzzi, and game room complete with pool table to make your next vacation one to remember! Holy Smoky is situated on a private mountain ridge in Shagbark Resort just minutes from your favorite attractions, restaurants, and outdoor activities! The view of Mount Chilhowie at the entrance of the Smoky Mountain National Park you will see through the 2-story wall of windows as you sit next to a roaring fire, or enjoy that view from the 8-person hot tub is the focal point of this Smoky Mountain Cabin Rental. Look no further. This cabin has it all. A luxurious custom-built 3-bedroom cabin boasts panoramic views of the Smoky Mountains from each of the three decks. Breathtaking views are abundant year round and it feels as if you are on top of the world. King of the Mountain has all of your favorite modern amenities with a touch of the past found on each of the three floors--WiFi, Hot Tub, Pool Table, Corn Hole, Outdoor Furniture, and Much More awaits! This cabin is LOADED with amenities. Located within one of the smokies most sought-after gated communities, Valley View is the perfect cabin to start an incredible adventure or wind down for some Peace and Relaxation! RedTail Lodge is a stunning 3-bedroom cabin with 4 spacious full bathrooms located in Grandview Resort, just 10 minutes from the action in Pigeon Forge! This recently built cabin has all brand-new furnishings, a new 7-person hot tub, a gas grill and plenty of outdoor rockers and chairs to relax in while taking in the mountain views. The full kitchen is complete with everything you’ll need to cook delicious meals, plus a 6-person dining table and barstools at the kitchen counters. Just Added to Website! Bluff Mountain Lodge is a unique 3 bedroom cabin overlooking the Smoky Mountains and Mount Leconte. The cabin features 3 large bedrooms and 3 levels for plenty of room for the whole family. Large 3 Bedroom, 3 Bathroom cabin in Shagbark Resort featuring professional grade arcade games! Large Open Kitchen, Dining area, Large Glass Gable Wall, and 3 Master Suites! Games with a View is sure to impress the whole family with it's endless amenities and stunning views! Sleepin' Inn is the Perfect place for your next vacation! Located right in between all the action of Pigeon Forge and all the Attractions of Gatlinburg in the ever saught after Sky Harbor Resort. You are only minutes from Dollywood, Splash Country and the Ripleys Aquarium! This 2 Bedroom 2 Bathroom beauty has everything you need to make your Smoky Mountain Vacation a Great One! Indian Summer is located in the peaceful town of Wears Valley, Tennessee. Close to the excitement of Pigeon Forge and convenient to the Great Smoky Mountain National Park. This 3 -level, 2 bedroom cabin is perfect for those looking for all the comforts of home, plus more! Immaculate 2 Bedroom cabin nestled in Shagbark Resort. This cabin features 2 Master Bedrooms, 2 levels, arcade game, pool table, hot tub, and many more awesome ammenities that will be sure to impress you and your family! Brand new cabin to our Program--Reserve now while availability lasts! As Good As It Gets is guaranteed to be your new favorite Smoky Mountain Getaway--From the ultra-wide decks to the large glass gable wall, As Good As It Gets offers an impressive space to enjoy the nature of the Smoky Mountains! Newly Renovated with all new furniture! Welcome to Something Extra in Pigeon Forge! This cozy, luxurious 2 bedroom, 2.5 bath Smoky Mountain cabin rental is ready to wrap you in total comfort. Spacious Driveway enough parking for 5 cars ! Conveniently located just off the Parkway, you’ll have quick, easy access to the Tanger Outlet Mall, dining, shopping, Dollywood and Dollywood Splash Country, theaters and everything else that make the Smokies such a wonderful place to vacation. Cubby Bear is a spacious 2 Bedroom cabin located in Black Bear Ridge Resort! Are you looking for that perfect little hideaway in the Smoky Mountain woods? A charming cabin for 2 where you can spend a secluded week or weekend with that special someone? If so, be sure to check out Inspiration Point! This 1-bedroom, 1 ½-bathroom cabin features the right amount of space with an exciting mix of amenities, including an outdoor hot tub, indoor jetted tub, big screen TV, and pool table. Luxury log cabin features spacious bedrooms with queen beds, a fully equipped kitchen, dining room, living room with sleeper sofa, a gas fireplace, cable TV and DVD, washer and dryer, pool table, foosball, a wrap around covered porch with gas grill, rocking chairs, a hot tub and a resort swimming pool.